“It gives me particular satisfaction to be able to read this citation as I am myself a graduate of Manchester Metropolitan University, or Manchester Polytechnic as it was known in the 1970s when I studied there. As a loyal ex-student I have stayed in contact with the Graphic Design department, and recently have been working with various other departments across the University. I have therefore been given plenty of opportunity to observe the way it has begun to evolve in the last few years. One man in particular has proved himself to be instrumental in guiding that evolution, and I am delighted to be able to speak in support of Professor David Crow, the Dean and Pro-Vice-Chancellor, who will accept this Award on behalf of Manchester School of Art. I have known David Crow since he too was a student of Graphic Design at Manchester Polytechnic in the mid-80s. He came to work as an intern at my design company Assorted Images, and so impressed us, both as a person and as a creative talent, that we offered him a job immediately upon his graduation. It was evident that he was a man destined for great things. Not only a talented designer, with a fresh approach to creative work for commercial clients, he was clearly driven by a passion for the design process itself and was keen to demonstrate the greater role it can play in people’s lives. As a student, he was already publishing his own magazine, Trouble, dedicated to raising awareness of ethical issues in design. This desire to explore the nature of communication, and to share and discuss it with other designers has informed his entire professional life. He gave up a successful commercial practice, which he had formed after leaving Assorted Images, when in 1995 he entered education as Head of the Department of Graphic Arts at John Moores University in Liverpool. 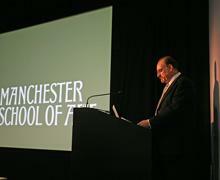 He remained there until 2004, when he moved to Manchester and took over as Head of the Department of Design. Here he rapidly set about harnessing the energies within the department, employing new staff and empowering existing staff to deliver to their potential, and thus he began to shape a new department that was ready for the 21st century. In only 5 years he progressed from Head of Department to his current position as Dean, where he has had an immediate, and destined to be lasting, impact. David Crow is also a man of great humility, and he is the very first to say that he accepts this award in recognition of the work of the entire educational staff at the School. But I also know that without a person such as David Crow at the helm things may not have come to this turning point for the School so quickly and so effectively. Under Professor Crow’s leadership a radical repositioning of the old school has taken place. In a move to redefine what was a faltering identity, and with a clear aim to restate the original ethos of ‘supporting the creative economy of the region’, David's proposal to revert to the name ‘Manchester School of Art’ was readily adopted. This had been the name given to it in 1838, and was carved in stone in 1880 above the main door of what is the second oldest art school in England, and today is one of largest providers of art and design courses in the UK. This fundamental rethink has been translated into a 32 million pound programme to create an entirely new building and refurbish others. The new building, scheduled to open in 2013, is designed with direct collaboration between architects and teaching staff to redefine what an art school could be, whilst the regeneration of old buildings ensures their sustainable re-use. This will establish a new creative environment that addresses the needs of design education in the 21st century, whilst recognising the School’s enviable heritage and International reputation. These carefully thought out facilities will reinforce plans to enhance multidisciplinary and collaborative working through curriculum innovation. As part of this process the Manchester DESIGN LAB was established. This is a multi-tiered project linked to professionals working in the region: design studios, city galleries, regional councillors, and researchers. In turn these Labs are linked across the University with colleagues in Science, Engineering, Business and Humanities. The school is also an active participant in the annual Manchester Design Symposium, and the first Manchester Fashion Week taking place in April this year. This demonstrates that educational innovation and enterprise are not confined to capital cities, and that with enlightened public support design education can be an inspiration for urban regeneration, and a complement to City Council initiatives such as Media City and The Sharp Project, which are bringing a renewed focus on the creative industries to Manchester. Professor Crow and his colleagues are now introducing an exciting new experimental module – the snappily titled ‘Unit X’ – across the entire undergraduate curriculum ensuring every art student takes part in an external facing, multidisciplinary team project in each year of their study. Staff teams have been coordinated to support this collaborative work both inside and outside the School. Plans are in place to link the staff and students at Manchester School of Art with other major institutions along what is now known as ‘The Corridor’, a mile long thoroughfare running from the centre of the city, which is fronted by major galleries, museums & theatres, as well as universities, and the colleges of music and medicine.